The Devahuti-Damodar Library (DDL) is a specialised library that houses books on history, culture, religion, philosophy, politics, ethnography, numismatics, and archaeology, as well as old travelogues. It is one of Manana’s core activities. The library has a collection of over 7,000 rare and contemporary books along with a variety of published and unpublished materials. The nucleus of the library, the Devahuti-Damodar collection is the product of Professors Devahuti and Damodar’s lifetime dedication to scholarship and comprises a valuable collection of 4500 titles on Indian history and related areas of South East, Far East and Central Asia. The library regularly updates its collection. The Devahuti-Damodar library is a member of the Developing Libraries Network (DELNET) which maintains a central online union catalogue of books, as well as serial and non-book material of all participatory libraries. DELNET at present has 5369 libraries as its members, of which 254 libraries are in Delhi, 5090 in other parts of India, and 25 outside the country. 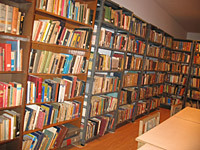 As a member of DELNET, the library has access to its databases and its online union catalogue of more than one million records along with several other facilities; The most important facility for members being the inter-library loan whereby books and other material of all affiliated libraries becomes available to them. We have a group of eminent academicians belonging to various universities of Delhi, who give recommendations regarding books to be acquired. They also encourage students to use the resources at Manana as well as participate in our other activities. 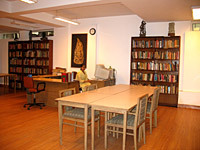 The library has a dedicated, predominantly young membership —undergraduate and graduate students, management trainees, and medical students from various colleges of Delhi University, JNU and JMI. It assists research scholars with their projects, and being the only library of its kind within a radius of 10 kilometres in South Delhi, Manana also performs the role of a neighbourhood library, specially for the aged and retired, who make full use of its resources. Manana in turn gains immensely from their patronage. Over the years the library has evolved into an energetic centre for youth activities. It plays an active role in organising academic lectures, seminars and workshops in order to encourage student-teacher interactions beyond the classroom. 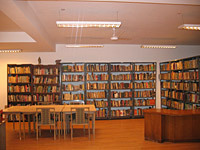 Located in the heart of South Delhi, in Greater Kailash II, the library is computerised, well maintained and air conditioned, and has soft spoken and efficient staff. The collection is available to members free of charge. To inculcate an interest in reading among children, Manana in partnership with AWIC (Association of Writers and Illustrators for Children) has started a Children’s library with the specific aim to provide books to underprivileged children. Manana’s Support School Programme seeks to promote its goal of reaching out to children who otherwise cannot access such a facility, and develop in them, a habit of reading and book culture. Housed in Manana, the Children’s library has a vast collection of story books on history, nature, science, and mythology, including tales from the Panchatantra and Jataka. These are both in Hindi and English, and are suitable for various age groups. Besides nurturing an interest in reading, the vivid illustrations in the books also arouse the young readers’ imagination and creativity. The library is open to children from 1.30 to 4.30 in the afternoon, every weekday.